Uniworld has already released its new 2014 brochure for Asia, which gives an insight into the range of river-cruises it will be offering this year. 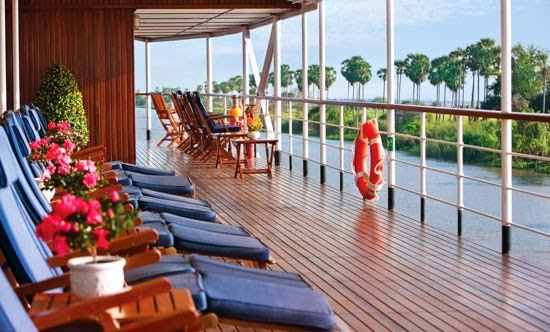 Itineraries in China, Vietnam and Cambodia range from 11 to 18 days in length. There’s also a new 12-day ‘Treasures of China & the Yangtze’ cruise and tour that provides travellers with a new luxury option to discover the glories of China’s history and culture. It runs from Shanghai to Beijing and takes in the highlights of the Yangtze River, as well as a land extension to Xi'an. The itineraries are a combination of land touring and cruising the Yangtze and Mekong rivers on the Century Paragon and Century Legend, as well as the French colonial River Orchid. On land, guests stay in five-star hotels such as the Sofitel and Ritz-Carlton in Beijing, the Waldorf Astoria Shanghai and the Intercontinental Hanoi and Park Hyatt Saigon. The sun deck of River Orchid on the Mekong, Vietnam. As with many of Uniworld's cruises in Europe, these Asian journeys also incor- porate special regional meals, such as a dim sum lunch in Shanghai, traditional dumpling and Tang Dynasty dinner in Xi’an, family-hosted lunch in a traditional Beijing courtyard house, and Beijing’s signature Peking duck. In Cambodia a highlight is an Apsara dance show accompanied by a traditional Cambodian meal. During the Mekong River cruise, guests can take a sampan among traditional floating markets to a village and fish farm, while shore excursions along the Yangtze River include a smaller riverboat cruise to the exceptionally beautiful Lesser Gorges and visit to the landmark Shibao Pagoda. Already explored the rivers of Asia or been on a Uniworld cruise? Readers would appreciate your insights, so why not leave a comment below.